Windows Phone has had a rough go of it of late. Microsoft first purchased, and then basically shuttered, Nokia’s smartphone division. Instead they wanted to back out of the market and allow their partners be the ones to showcase devices. Windows 10 Mobile has brought the same underpinnings of Windows 10 to the smartphone space, as well as the promise of Universal Windows Platform (UWP) apps which can run on both the desktop and mobile devices. One of the interesting features that came out of Windows 10 Mobile though is Continuum. On the desktop, Continuum allows the device to be switched into a touch first mode, for use on 2-in-1 devices, but on the Windows 10 Mobile side it kind of does the opposite. You can plug a sufficiently powerful Windows 10 Mobile smartphone into a docking station, and use it as a more traditional PC. While this is an interesting endeavour, on the consumer side I can’t see this being a hugely practical situation, although there certainly could be use cases where you could see this being useful. The one market where Continuum could be very successful though is in business. You can see a scenario where you have sales reps who travel a lot, and rather than having to bring a laptop with them or keep cubicles with desktops for them to use in the office, you could instead have them just dock their phone and get to work. That’s pretty much the idea that HP has come up with, and they are showcasing Windows 10 Mobile as the operating system of choice to get this done. We’ve seen some of this in the past, but the level of execution here due to updates to Windows 10 and the UWP mean that it’s finally a scenario that you can envision working. Let’s start with the handset. Just recently Microsoft released the Lumia 650 as a “business” focused phone, and while I suppose you could market anything as a business device, the 650 lacks both Windows Hello and Continuum, both of which would likely be strong selling points in the market. HP has decided to not only make a phone targeted towards business, but the Elite x3 is a true hero phone for Windows 10 Mobile. This phone literally has everything you could think of, and then more. Let’s go over the basics. The HP Elite x3 is a phablet, coming in with a 5.96-inch WQHD AMOLED display with Corning Gorilla Glass 4 to protect it. It has a graphite exterior with Bang & Olufsen stereo front facing speakers, and three integrated noise cancelling microphones. The rear camera is a 16 MP shooter, and the front camera is an 8 MP camera with Iris scanning capabilities for Windows Hello. In addition, although the current incarnation doesn’t have it yet, the final shipping version should also have a fingerprint sensor on the back. The bottom has a USB-C connector for charging and Continuum. The body is 7.8 mm thick and weighs 195 grams, and it is IP 67 rated and designed to pass MIL-STD 810G testing. Powering the Elite x3 is a quad-core Snapdragon 820, which is the Kryo based processor set to replace the not well loved A57 based Snapdragon 810. This is Qualcomm’s first custom chip design based on 64-bit ARM. Qualcomm was the chip company to beat when their 32-bit Krait chips were around, and although the switch to 64-bit was a rough one, we will finally be able to see a proper FinFET based custom design. The Snapdragon 820 also features Adreno 530 graphics. RAM should not be an issue, with the Elite x3 sporting 4 GB of LPDDR4. Storage will be ample, with 64 GB of eMMC 5.1 as the onboard storage, and you can add another 2 TB of storage over micro SD. It also has 2x2 802.11ac wireless, NFC, and Dual nano SIMs, or nano SIM + micro SD with an adapter. Because this is targeted towards enterprise, there are some additional requirements. The Elite x3 includes dual biometrics (Iris and Fingerprint as stated earlier) and is FIPS 140-2 certified, with Secure Boot, full disk encryption with a 256-bit key, fTPM 2.0, Bitlocker, and VPN. As a smartphone, HP has basically covered everything they could possibly think of. Now for the cool part. Since the phone supports Continuum, HP is also including a docking station. This is a typical Continuum dock, and the phone sits in the dock which is powered by a USB-C cable, and offers Ethernet, two USB ports, and DisplayPort. Put this on a desk, and hook a keyboard, mouse, and monitor up to it, and you can have your mobile workers come in with just their phones, and they can plug them in and get to work. But HP has also though beyond this scenario. What about the mobile worker who generally has a phone and a laptop? Sure we’ve seen the dockable phone before in the Motorola Atrix but that was a long way from what is possible with Continuum. Since Continuum is built into the operating system, a lot less magic is needed from the OEM to make something like this work. 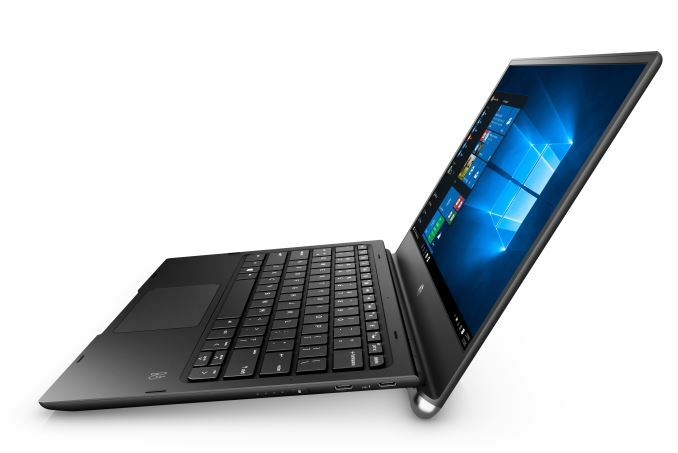 HP will be offering the HP Mobile Extender, which is a laptop with no processing power. It is instead just a battery shell which offers some I/O. It is a 12.5-inch 1920x1080 laptop, with integrated Bang & Olufsen stero speakers. It has a USB-C connector to hook the phone up to, and it has two more USB-C ports for I/O and power in and out, along with a micro HDMI jack. The keyboard is a spill-resistant model with a drain and backlighting. The laptop is only 13.8 mm thick (0.54-inches) and weighs only 1 kg (2.2 lbs) and it houses the 46.5 Wh battery. The battery can be used to charge the phone while its docked, as well as run the display. There is no runtime listed, but a battery that size should be able to run a smartphone for a long time, as well as whatever is required to run the display. All of this is centered on Continuum. As mentioned earlier, Continuum allows you to run your phone as a desktop PC, but the app selection is restricted to UWP apps which support Continuum. At the moment, that isn’t a huge selection, and you can’t natively run any Win32 apps. HP has a solution for this too, which is HP Workspace, whichi is an app catalog to let you access virtualized apps. App virtualization is not a new technology, so HP will leverage HP Workspace to use this existing tech and stream business apps to the phone. 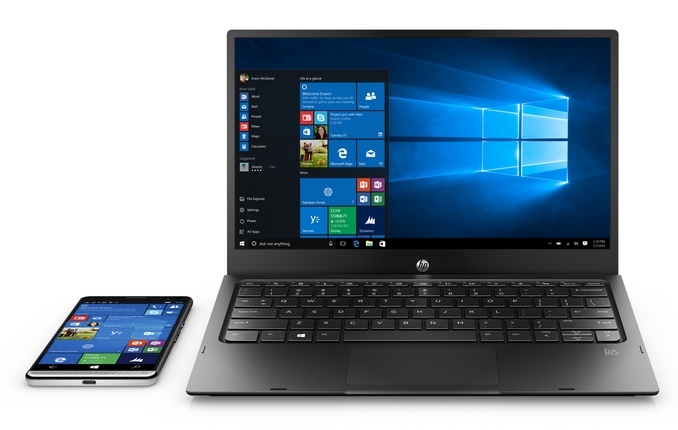 This is already a popular solution in business to get line of business apps out to mobile devices like tablets and phones, and HP’s version has full support for Continuum. HP’s Elite x3 is certainly a bold step forward for the company. It is embracing new Microsoft technologies much like they have in the past with the Windows Media Center PCs and Windows Home Servers over the years. This new offering is certainly compelling in the fact that they have some great looking hardware, with a focus on enterprise and solutions for business workers. Make no mistake. This phone is not going to upset the balance of power, or raise Windows 10 Mobile’s marketshare into the double digits, but HP needs to do neither of those to be successful. This is a package focused on enterprise, and the components are centered around services like their App virtualization which will generate income for HP based on subscriptions. HP doesn’t even have a price yet for the phone, and it will not ship until August. Although this may change, at the moment HP is going to sell the phone through their channels into business, so this phone is unlikely to find its way into consumers hands any time soon. But that’s actually fine. Microsoft’s big play in mobile has always been the enterprise, but it’s the one that that they seem to have ignored for the last five years. In the right context, this is a pretty interesting device. The laptop dock really needed wifi ad to be relevant. What they do here was ok 10 years ago and yesterday but not today. Continuum is is also less potent than Chrome OS for now, not much of an asset. Enterprise if where such corporations without ideas go to die,it is alarming when consumer brands try to find refuge there. Continuum is only less potent because Google is being anti-competitive and not releasing apps or allowing others to create truly capable apps that access Google services. As they do on iOS. Which would still be pointless because as others have said you don't need that much bandwidth - all of the actual work is being done on the phone. Display, input, battery... nope, not necessary. 802.11ad in the MeDock would be almost as pointless as his clumsy attempt to attack it.